Over the last decades, we have seen different technologies in every field that were designed to help people in their day-to-day life. Similarly, many such advancements have also been made in the food industry. Powerful machinery, like immersion blenders, are replacing traditional methods to prepare ingredients, cutting back on time and making it possible to prepare restaurant-quality food at home. In this article, we have highlighted the features, as well as listed down the pros and cons, of three of the best immersion blenders for your benefit. Immersion blenders, as the name suggests, blends different ingredients into a smooth consistency. As a result, you can prepare smoothies, milkshakes, puree, soups, and even baby food in a matter of minutes. The blenders on this list are manufactured to be easy to use for your daily kitchen activities. Not only does it blend your food in the minimum amount of time, but it also gives you the food you have only ever tried in restaurants. Being a U.S.A.-based brand producing only premium-quality kitchen appliances, Chefman has made the lives of many chefs (and pseudo-chefs!) easier. Even more, they also provide a one-year warranty on all their products. What makes the Chefman Immersion Blender stand out? Let’s see! First of all, this blender comes packed with a powerful 300W motor. Because of this, you can efficiently blend out chunky ingredients into silky soups in no time. With an ultra-quiet motor, you can also work in peace as well as not disturb your entire household. Also, in this immersion blender, you can easily switch between two speeds by just pressing a button. The dual-speed control helps you adjust to the setting that you feel more comfortable with for your specific task. This small machine is designed to fit your hands perfectly. With a soft-to-touch rubber handle and a curved contour, you will not have to worry about your blender slipping from your hands ever again. What’s more is that this blender comes armed with cross blades that can crush ice efficiently. These specifically designed blades ensure to give you the smoothest blend ever. With a weight of only 2.2 pounds, holding the blender for a longer time period will not get you fatigued. Since this machine comes in five color options, which are pink, pastel pink, purple, wink, and royal blue, you can definitely add the pop of color you always wanted in your kitchen. Equipped with a detachable shaft, clean-up has never been this easy. Simply twist the shaft to remove the blade part of your blender and wash it under running water. Also, this immersion blender is dishwasher-safe. Therefore, you can save up more time by just popping it in for a quick wash. Finally, it also comes with a protective guard to avoid messy splatters while blending. Koios, named after a Titan from a Greek myth, is a trusted brand that specializes in home electronics. With innovative products, like their Ultra-Stick immersion blender, this company aims to make the food prep experience more enjoyable. With a powerful 500W motor, we can assure you that you will get the smoothest blend using this machine. This is made possible thanks to its integrated six-speed control and a turbo setting option that give you multiple options for your tasks. This product comes with a stick blender motor, S-blade blender shaft, whisk, and a manual book. Being made with stainless steel and plastic, you will get a strong motor with a sturdy stick design that can handle many tasks. The two different attachments it comes with mean that you can have a wide range of functions for this blender. The S-shaped blade can help you puree any ingredient, making the creamiest soups or frothiest milkshakes. And, with the whisk, you will not need any other blending machine for baking. Above all, this immersion has a long lifespan and is very durable. With a weight of 2.2 pounds, you will not have to take long breaks in the kitchen due to fatigue. This blender is available in only one color, which is black. Due to its detachable attachments, cleaning the parts of this blender is super easy. However, the dishwasher is not recommended to be used. Instead, it would be best if you wash it under running water. Similar to Chefman, Aicok is also a U.S.A.-based brand that is known for selling products dedicated to your home. This powerful, multi-featured immersion blender is an example of one of their proud innovative products. Firstly, this blender comes with a 350W motor unit to provide you with powerful blending for multiple recipes. Secondly, it is aided with a six-speed and two turbo settings to give you maximum control over your ingredients. You can use turbo boost to blend with maximum power and the standard buttons on the motor to adjust the speed of your blender according to your need. This immersion blender has multiple functions, such as chopping, blending, whipping, whisking, and more. It comes with a food processor, beaker, whisking attachment, and the motor handle. Apart from this, you can find six-speed dials and a turbo button on the handle to switch between speeds. The four pro blades, along with the whisk, are all made using quality stainless steel. What this means is that they not only provide durability but also ensure an extended lifespan. With a weight of 4.1 pounds, this blender is designed while keeping your health in mind. Some parts of this machine are made from 100% BPA-free plastic. You will also be glad to know that it is approved by the FDA. Also, it comes in a standard black color. Because of removable extensions with a quick click action, you can easily wash different parts of this machine. However, make sure not to submerge the motor in water. Apart from this, the blender is also dishwasher-friendly. Summing up this review for best immersion blender, we can see that each have their own positive points. 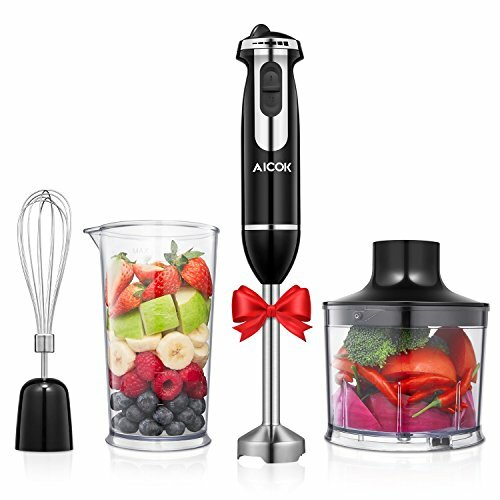 However, we have concluded that the one from Aicok is indeed the best-quality immersion blender at its price. With its multiple speed-adjustment settings, durability, and powerful motor, this product is a clear winner. 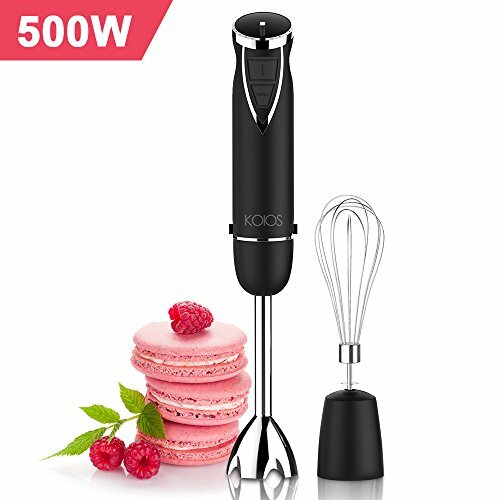 Other positive points are that its parts are made from BPA-free plastic, and it is extremely easy to clean, making it the perfect blender for all your kitchen needs.